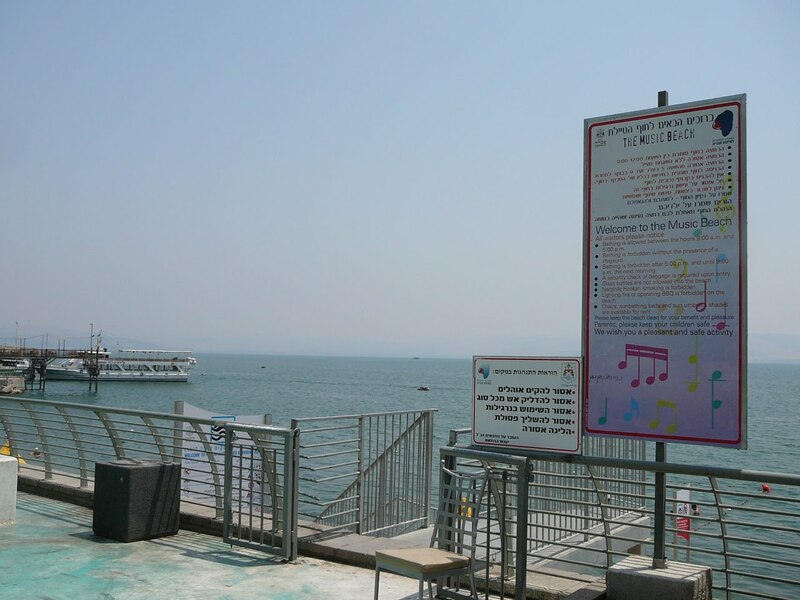 Our third and last day in Israel we travel North to the Sea of Galilee. The countryside changes dramatically to green rolling hills covered in groves of Olive Trees. This is the land of the New Testament and everything about it is evocative of those stories. 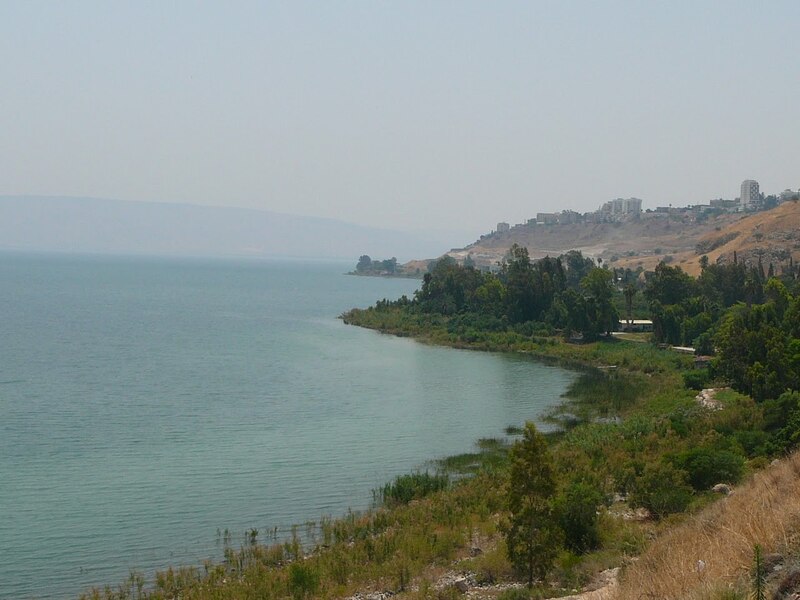 The Sea of Galilee is lovely, cradled in amongst the green hills with small beaches shaded by olive trees. We hurry on to the more spiritual sights of the Mount of Beatitudes and Capernaeum. Everything here is quiet, the crowds of tourists have been left behind, and we are free to soak it all in. We continue on to Safed, which we have read is a beautiful spot on top of a mountain. A lovely old town and artists colony, with breathtaking views. The perfect spot for lunch, or so we think. But as so often happens, the reality is less than perfect. The views are spoiled by a thick haze, the town is old and vaguely attractive, but certainly not beautiful, and the artists colony is obviously a collecting point for artists with very little talent . It is also lacking a nice place for lunch and we end up eating sandwiches on the side of the road. We continue on our way to Akko, a harbour town and beach resort just north of Haifa. It is only 25 miles north of Haifa, but is noticeably nearer the border of Lebanon. We pass camouflaged tanks by the side of the road while jet fighters fly overhead. Another reminder of where we are. Akko however, (also known as Acre and Acra, a base for the Knights of St John) turns out to be a favourite place with an old walled town, full of winding passageways, secret tunnels, bazaars and restaurants. This old town sits on a rocky promontory. The fortified walls facing the sea create a lovely walk and an excellent place for children to leap dramatically into the blue sea below, screaming with feigned fright as they plunge into the crystal clear water. Where the old wall turns inland, there is a rugged stone jetty pointing out to sea, creating a harbour lined with restaurants and filled with small fishing boats and larger recreational yachts. A little further round the headland, the modern part of the city lines neatly up behind a long sandy beach. It is a lovely spot. ….. …We pass through many fairly affluent towns with comfortable housing, good roads and pleasant parks. But we also pass collections of tiny one room tin shacks with no roads, that are reminiscent of the shanty towns in the south of Peru. The next step up the housing ladder is represented by the clusters of sheds that pass for houses, each with a small fenced yard supporting a couple of animals, and approached by a dirt track. ….. ..There are fabulous modern hotels and spas staffed by surly Israeli staff who it seems would rather be doing anything other than waiting on tourists. ….. …Hitchhikers are everywhere. Young single women, middle aged business women, elderly men, students, military personnel, all stand by the roadside hitching, and all get rides immediately,. It is perfectly safe to hitchhike and yet there are armed soldiers everywhere. ….. …Jerusalem is a huge sprawling affluent city centered round the famous old city where the housing for many seems little better than slums. ….. …We had the best meal of our entire trip in a wonderful French restaurant 100 yards outside the old city walls of Jerusalem, served by attractive waiters and waitresses who fawned over our every need, while inside the city walls the restaurants were mainly poor with service that was distinctly unfriendly. ….. ..This was one of the most expensive countries we have ever visited, and yet there is a noticeable percentage of the population that is penniless. ……..It was a fascinating country and Jerusalem was definitely the highlight of our trip, and yet we leave it with a sense of relief. We are happy to get out unscathed. It's been a while since I was in Israel. But Haifa was by and far was my favourite. I also enjoyed Eilat. Jersusalem, yes, while very spiritual, I found to be not very hospitable. Tel Aviv was dirty. All in all, Israel was a fabulous country to visit. I would very much like go back!